Gluten-free, flourless healthy chickpea or black bean brownies packed with nutrients for an equal-parts delicious yet healthful dessert. This easy dairy-free, refined sugar-free dessert recipe only requires a few minutes of prep time and is made conveniently in your blender! There are two types of people: those who have tried chickpea or black bean brownies and have made them 50 gazillion times as a result, and those who have never tried chickpea or black bean brownies. If you fall into the latter category, I’m here to help! I’m willing to bet if you give them a shot, you’ll be compelled to make them time and again. My guess is you already have every single ingredient you need right there in your pantry in order to make either chickpea or black bean brownies. For me, this recipe is an oldie but a goody – it has been revised many times over the years, and has been a staple in my home ever since I tried them for the first time 5 years ago. 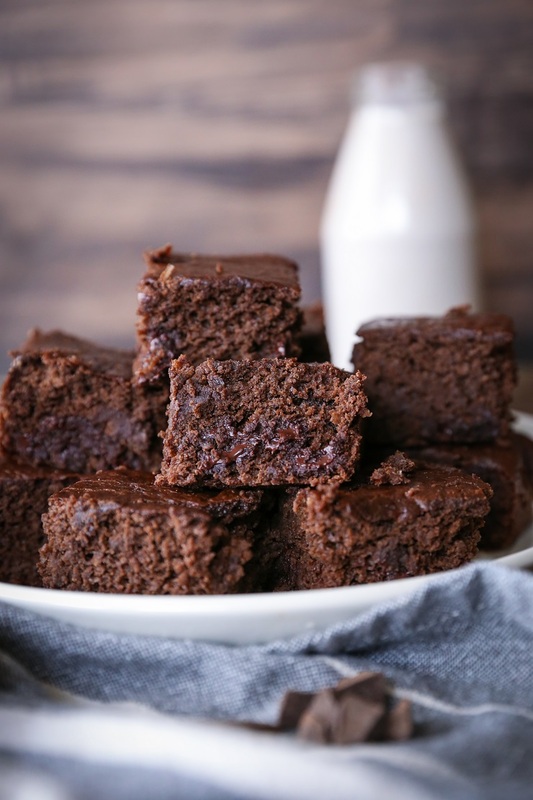 Our first go at garbanzo bean brownies was back in 2012, when – I daresay – the world was not yet ready for them; however, with the introduction of black bean brownies about a year later, you all took to the bean brownie like white on rice. Now that we’ve had time to marinate on the idea of a healthy brownie made from the very ingredient we like to use in our chili, I thought I’d revisit the subject. This classic recipe works for both chickpeas and black beans. You can easily double it if you’re looking to serve more than 9 people (or if you’re a mega fan of dessert leftovers). You can also add all sorts of your favorite brownie add-ins, such as chopped walnuts, some peppermint extract and/or orange extract + orange zest if you’re going for a different flavor altogether…you can even add booze, my friends. Cointreau, for instance, is quite the brownie companion. All you need is one 14-ounce can of the bean of your choice. Drain and rinse the beans in a colander, then add them to your blender along with the rest of the ingredients, save for the chocolate chips. Blend it up to make your batter, stir in the chocolate chips, then proceed as normal. Pour into a small baking sheet, bake for only 25-ish minutes, pull them out of the oven, then play the waiting game. It is imperative you allow these brownies to sit at least 1 hour before cutting into them, or else they’ll fall apart very easily. If you’re doing a spoon brownie slash brownie sundae type of situation, the fall-apartedness shouldn’t matter and you can dig right in. If you don’t have coconut sugar on-hand, you can replace it with equal-parts cane sugar. I like using coconut sugar because it is considered a natural sweetener, is lower on the glycemic index than cane sugar, and contains minerals. You can also substitute the olive oil in this recipe with melted coconut oil, grapeseed oil, avocado oil, etc. Make homemade chocolate coconut frosting (use the instructions from this recipe). Top with homemade paleo salted caramel. Serve with a dollop of coconut whipped cream. Cut up some fresh seasonal fruit and top the brownies with it. And that’s it! Pour, blend, bake, repeat! Preheat the oven to 350 degrees Fahrenheit. Lightly oil an 8" x 8" baking pan, and line the pan with parchment paper. 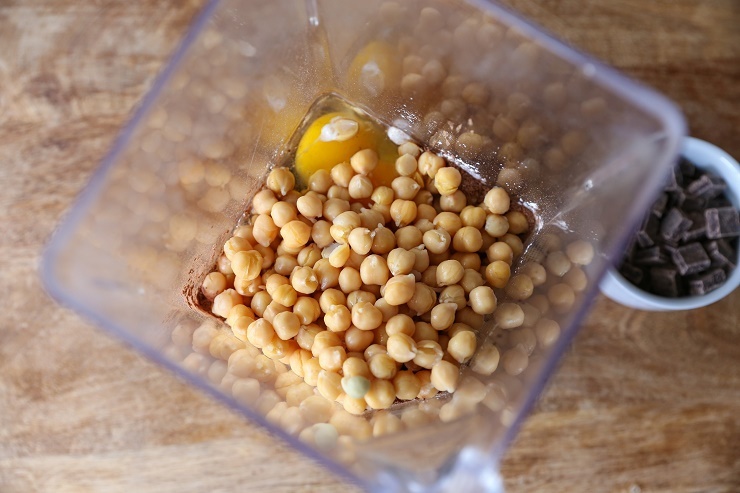 Drain and rinse the chickpeas (or black beans). Add them to a blender along with the rest of the ingredients, except for the chocolate chips. Blend well until a thick, smooth batter results. Transfer the batter to the prepared baking dish and spread into an even layer. Bake on the center rack of the preheated oven for 24 to 18 minutes, until the center of the brownies have set up. Note: The center of the brownies will not test clean when poked with a tooth pick - this is normal. Remove brownies from the oven and allow them to rest 1 hour before cutting and serving. Hi Kaleigh, my apologies, I somehow left out the cocoa powder. I use 1/3 cup. I added it to the recipe..thanks for the catch!! Hope you enjoy! Looks great! I wonder if you know what’s the ratio if I use dried chickpeas instead (can’t find canned chickpeas where I live). Thanks and greetings from Brazil! Hi Daniele! You will need about 2 cups of cooked chickpeas, so I’m not sure how much that is dried. Hope that helps, and enjoy!! Ohhhh I just LOVE these. I haven’t made chickpea OR black bean brownies in forever, and now I feel like that needs to change considering I always have them on hand. How are these even real??! I have yet to try the bean brownie because the texture always looked off to me but these look PERFECT. I would run and make them right now if I didn’t have 3 batches of cookies on the counter from testing over the weekend. I wish we could trade!! I have been wanting to try black bean brownies for sooo long and just tend to forget about them! And with chickpeas! Yes please! These look perfect! Ohhhhhh girl, you will LOVE them! You’ll never go back, je promise! YUM!!! YES!!! So perfect I am so making this for my Mom and I tomorrow! Do you think I could sub Maple Syrup for the sugar??? Can’t wait to try! Hi Caitlin! YAAS I’m so glad you like the brownies! 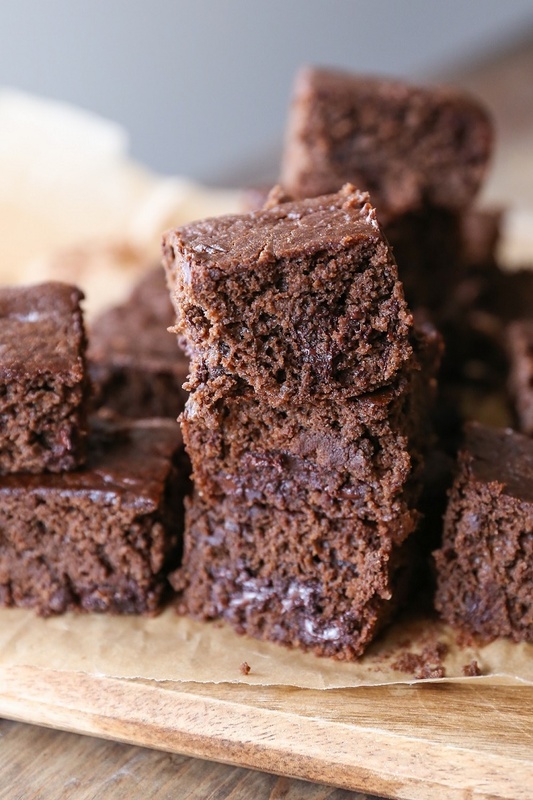 I betcha you can substitute maple syrup for the coconut sugar, although the consistency of the brownies may be a bit different and you may need to bake them longer. I’d test the batter with 1/3 cup of pure maple syrup and see if that’s sweet enough. If not, add a little more. Let me know how it turns out!! Hi there I just tried your recipe today. I substituted the 2 eggs with 6 tablespoons of aquafaba, baked it for 35 minutes and it turned out way too fudgy (super fudgy) and there was a weird aftertaste, probably it was the chickpeas. Could the fudginess came from the aquafaba substitution? Or is there any way to make it less fudgy? Oh no, I’m sorry the brownies didn’t work out for you! I’ve never tried using aquafaba in my recipes, so I quite honestly don’t know how it should work in this one. I’ve made this recipe dozens of times using eggs and it’s never turned out overly fudgy, so my guess is the aquafaba was the culprit 🙁 If you’re looking to keep the recipe vegan, my guess is you’d have better results replacing the eggs with applesauce or a banana. Let me know if you give the brownies another go!! 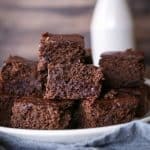 I’m diabetic and would like to know if the brownies can be made with truvia instead of the coconut sugar? Delicious! Since I also avoid coconut sugar, I substituted 2/3 cup of date paste mixed with 2/3 cups of water. Makes the squares even more gooey. My whole family love it. Thanks!